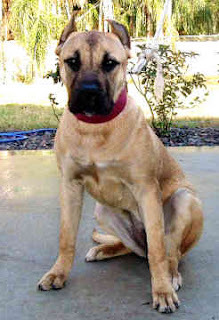 This breed of dogs is also known as the canary dog, they came to exists with the crossing of two breed Bordino majiro and Imported English Mastiffs. This breed originated in America, their core work was to fight with other dogs but with the restriction of law imposed on dogs fighting this breed became very rare but was re_envent by Dr carl in America. They are a very powerful breed their physical strength is more then any other breed in the world, their large head and broad chest distinguish them from other breed. Presa canario show an aggressive expression, they are bold, brave and courageous they have very strong and loud bark, they are very loyal with their family and became aggressive if sense any danger towards them, This breed are also a good watchdog, they can protect their family and territory against strangers and un sound situation they are not good for home. Presa canario do not do good with small children and other pets. the Presa canario is not good for first time dog owner they are very dominant and demanding, they need extra attention towards them, they can be very dangerous if they are not treated well or are not handle well. This breed of dogs has a single coat which short smooth and shinny hair, they are average shedders, it is mandatory to make them socialize in their early age, they are good learner but will not respond to hard and harsh methods of training. Training should be given to them with fairness and patience. Presa canario are not good for apartments they do best in field like areas where they have some job to do, they enjoy daily walks and play sessions. Brushing should be done regularly to avoid dirt and dead hair, bathing is done when needed. Health problems associated with this breed are hip dysplasia, demodex mange, a diminished immune system, and eyelid problems.